In March 1877 it was announced in the Essex Standard, West Suffolk Gazette, and Eastern Counties' Advertiser that student Octavius Ralling had been successful in the Freehand and Model Drawing Night Art Classes of the Colchester Literary Institution. Although he was my Aunt Phyllis's grandfather-in-law, I've not been able to discover much about the life of Octavius, or even too much about his professional work. But there are plenty of surviving examples of his draughtsmanship for us to admire the skill that won acclaim for the 19 year-old student - albeit in what was effectively the family newspaper! The eighth son of Thomas Ralling, a journalist and newspaper proprietor, Octavius was born in Colchester in 1858. His father had started his working life in a print works, before becoming a journalist and then gaining part ownership of the paper. However, the Rallings were no more than modestly well off. And the family suffered several tragedies. Octavius's father died when he was 11. Although he was suffering from TB, he cut his throat, thus hastening his death from the disease according to the coroner. Octavius's mother died when he was 16. And two weeks after Octavius's success in freehand drawing was being praised by his journalist brother in the newspaper, his eldest sister Rosa hanged herself in the family home. By the time of the 1881 census Octavius and his younger brother Ernest were living with their eldest brother Thomas and his family in Colchester. Aged 22, Octavius was described as an Architect's Assistant. His elder brother James had gone to Exeter in around 1880 to manage an iron monger's shop, accompanied by his sister Emmeline. James and Emmeline lived at first at 110 Bath Road. In the same house was a retired tailor George Spratt, with his daughters and granddaughters, all teachers. By 1884 Octavius was also settled in Exeter. We read of him and brother James actively participating in an Exeter Parliamentary Debating Society. He was employed first by Exeter Architect R. Medley Fulford in Cathedral Yard. 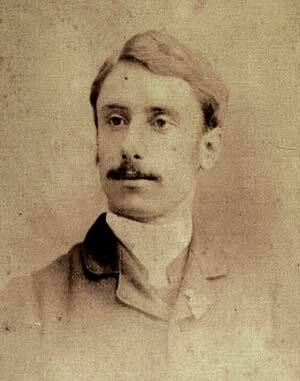 In 1888 Octavius married one of the teacher Octavius Ralling granddaughters from James's early lodgings, Ellen Brown. 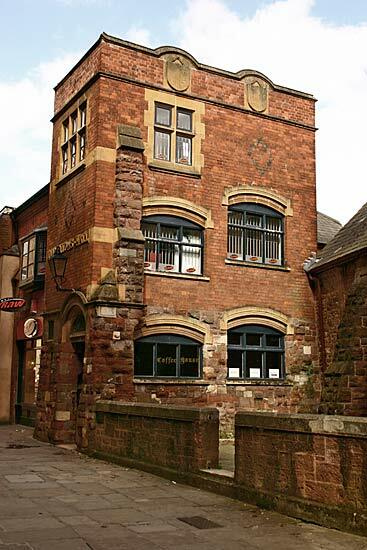 At about the time of his marriage Octavius was in practice alone, working at 17 Castle Street, but by the 1890 census he was in partnership with Lewis Tonar in an architect's practice in Bedford Circus, Exeter. The surviving records give testament to Octavius's civic, ecclesiastical and commercial work. He may have done much domestic work, but there is no evidence for that. An early success with his civic work was the design for the Public Rooms in Bodmin. In January 1891, it was announced that Ralling and Tonar's joint design had won the competition against 16 others for the new civic building. Its style has been described as free Gothic. Their work for commercial clients met with local approval, for example in 1891 and 1893 the local paper, Trewman's Exeter Flying Post, praised the design work of Tonar and Ralling for Exeter shops in the High Street (chemist Wynne Tighe's shop) and in Fore Street Hill (to be occupied by Lipton's). The partnership undertook much work for local churches, including, for example, restoring the nave and east window of St John in the Wilderness at Withycombe Raleigh in 1925-1928. In 1892 Ralling and Tonar won a high profile contract in Exeter when they were appointed as architects for the city's Tepid Swimming Baths. There was much made of this project in the local Press, general opinion being that public swimming baths for Exeter were long overdue and that they would be a real asset for the city. The baths were opened in September 1893, with a pool of 75 ft x 30 ft, 7 ft deep end with diving board, 3 ft 3 ins shallow end, a gallery for 500 spectators, hot and cold douche and slipper baths, 42 changing rooms, meeting rooms, and laundry facilities. They were located centrally, behind the High Street, more or less where the car park of the central library now stands. Despite the publicity that attended the baths' arrival they were not a huge commercial success and never made any money for their shareholders. The City Council acquired them in 1911, and they were destroyed by bombs in the Exeter blitz of May 1942. The architecture of the Tepid Baths was clearly not thought to have affected their commercial success, for in May 1897 the foundation stone was laid for Exeter's Turkish Baths, in Northernhay Street, which were also to be constructed to the designs of Ralling and Tonar. (In Pollards Official Guide to Exeter of 1894, Tonar and Ralling are actually described as "designers of swimming baths"). These baths opened in May 1898. The exterior had an "arcaded front" to the first floor; the interior had cooling rooms, plunge baths with douche and spraying equipment, and two hot rooms. On the first floor were private cubicles, and an open piazza surrounded by bays. On the top floor were bedrooms which were to be rented by the Rougemont Hotel which stood alongside the baths - these bedrooms could be accessed directly from the hotel. The interior was decorated with mosaics, and white glazed bricks with blue banding. The celebratory tone with which the opening of the baths was reported was premature, as within a year of the opening, the holding company had been put into receivership following the loss of a costly court case initiated by the chapel opposite the baths, which had objected to aspects of the baths’ design. But the baths themselves seem to have continued to function in some form until about 1910. At about the same time that they were working on plans for the Turkish baths Ralling and Tonar were completing the design of the new Oddfellows Hall, in Catherine Street, Exeter, just a stone's throw from their Bedford Circus offices. They commissioned the builder, Brealy. The foundation stone was laid in June 1896 by Brother P.G. Mansfield, who had been presented with a mallet and silver trowel by Octavius to perform the task. The inaugural meeting was held in the Hall in September 1896. 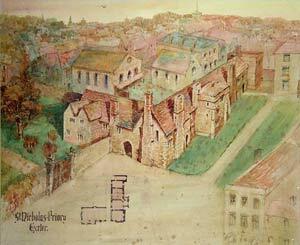 A major commission for Ralling and Tonar, and one that was probably dear to Octavius's heart was the restoration of St Nicholas Priory, Exeter. The Benedictine Priory was dedicated in 1087, and the small community of monks there played an active part in city life until the Priory was dissolved by Henry VIII in 1536. Some of the buildings were demolished and a remnant became the home for a wealthy Elizabethan family. It remained a family home until the nineteenth century when it was converted into five dwellings. The building deteriorated over time, and by the early twentieth century what were effectively tenements had become more and more dilapidated. In 1913 the Corporation purchased the building: Ralling and Tonar were given the job of restoration. 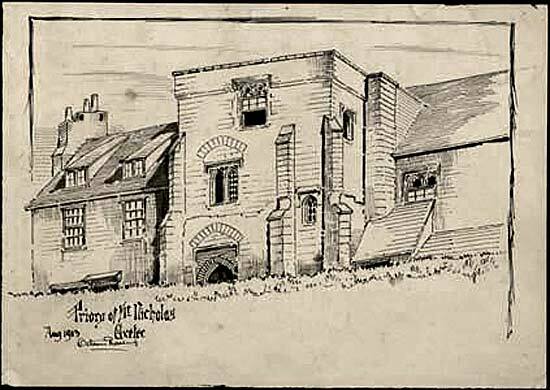 Octavius had been interested in the building long before getting the contract for the restoration as he had made several sketches of the Priory in the 1890s. The project took from 1913 to 1916. Ralling and Tonar were assisted by Harold Brakspear who was a medieval architectural historian. Octavius maintained a hands-on involvement with the work throughout the restoration. When it was completed the Corporation opened the Priory as a museum. Still a museum, further restoration has been carried out in the 21st Century, and the interior is now furnished and decorated to represent an Elizabethan town house. It is evident that as well as professional plans and drawings Octavius enjoyed sketching, particularly old buildings, and seized opportunities to indulge his pastime. He certainly sold his sketches for book and magazine illustrations. And in the 1896 Xmas edition of the Exeter Flying Post, Mr. T. Upward of Queen Street was advertising "private Xmas cards, including the new Exeter Card (sketch of the city by Octavius Ralling)". 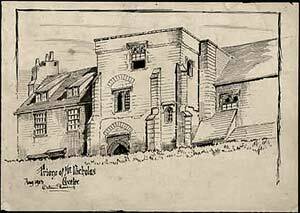 At the following Xmas the same gentleman was advertising cards with "a variety of charming Exeter views sketched by Mr. Octavius Ralling." In 1910 the Exeter Pictorial Record Society was established to collect pictorial representations of the most interesting features of Exeter. The collection contains paintings, prints, drawings, maps as well as photographs. Octavius contributed many sketches to this record of the city. Octavius was also greatly interested in politics. From his early appearance in Exeter in 1884 in the Parliamentary Debating Society, of which he was a leading member, he became an active Conservative - his name often appearing as a seconder or assentor of candidates for national and municipal elections. He was prominent in the affairs of the Working Men's Society, which despite its name was a Conservative group; he was for years the Hon. Secretary of an Exeter branch of the Primrose League - an organisation established to promote Conservative politics; he was vice-president of the St John's Ward Conservative Association. Indeed he may have allowed his political life to stray into his professional life, as in 1890 he was the architect for the new Thorverton and Cadbury Conservative Club building, which was later to become Thorverton Memorial Hall. It may be that Octavius's involvement in politics was due in part to the social aspects of his activities. When he was still in Colchester in his 20s the newspaper carried reports of his performances in local amateur dramatic performances. Just like his love of sketching, his interest in treading the boards never left him, for the Exeter newspapers reported his participation in plays, sketches and concert parties over the years, some of them organised by Octavius himself, often linked to his political activities. On occasions he was joined by his wife, and his eldest daughter, a singer and pianist, who shared his love of the limelight. In 1893 we find Mr and Mrs Ralling in a concert party at Ide. He was one of the longest standing members of the Devon and Exeter Architectural Society, being for a while its Hon., Treasurer. He was also a member of the Royal Institute of British Architects. He was a Freemason, but he certainly never reached the illustrious ranks of the order achieved by his brother Thomas. It is evident that despite the family tragedies that blighted his youth, Octavius was able to lead a prosperous, fulfilled and apparently happy life. He was married to Ellen for 38 years. They had six children who survived to adulthood, and the evidence suggests their marriage was a happy one. Three of Octavius's sons left England to work as planters, brokers, merchants and traders in Africa, South America and the Far East, though each of them served in France in the First War. Ellen died in 1926, and Octavius died less than three years later on 1 February 1929. They were buried together in Exeter Higher Cemetery. Sadly the grave stone has now been cleared, so there is no marker for Octavius's final resting place. But he left his mark on the architectural heritage of Devon and Cornwall. Despite Hitler and later developers, some of that survives still, along with his drawings, as a legacy of his talent. Sources: General Register Office of England and Wales Index of Births, Marriages and Deaths The Ipswich Journal, The Essex Standard, West Suffolk Gazette, and Eastern Counties' Advertiser, The Royal Cornwall Gazette Falmouth Packet, Cornish Weekly News, & General Advertiser, Trewman's Exeter Flying Post or Plymouth and Cornish Advertiser, Directory of British Architects 1834-1914, Royal Institute of British Architects, Heavitree Parish, Churchwardens’ papers, Rebuilding of Church Tower, Devon Recor, Office, Exeter Memories, St John in the Wilderness, Exmouth - A Guide and History, Representative British Freemasons , London: Dod’s Peerage Ltd. 1915, West Country Studies Library, Devon Library Services, St Nicholas Priory, Plymouth Library Services, Church History of Cornwall and the Diocese of Truro, W.S. Lach-Szyrma, London, Plymouth and Truro, 1887, I am indebted to Ben Clapp, Katherine Dunhill, David Cornforth, Graham Naylor, Lucy Brown and Vanessa MacDonald for their kind assistance. Octavious Ralling. Courtesy the Westcountry Studies Library. 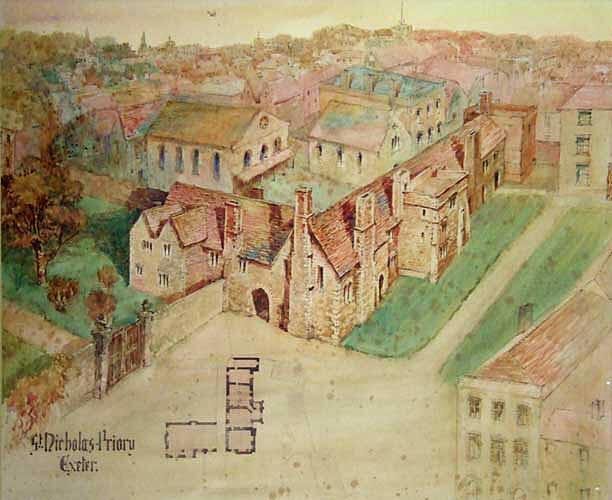 Drawing showing how the Priory could be restored for public access 1915. Courtesy the Westcountry Studies Library. An example of Ralling's skill as an artist. Courtesy the Westcountry Studies Library. Oddfellows Hall, designed by Tonar and Ralling. 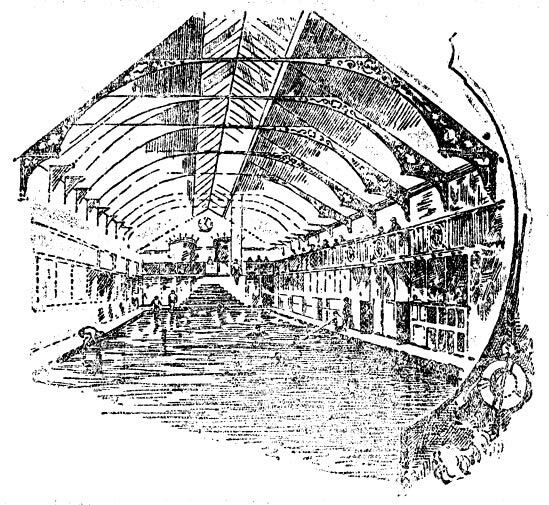 The tepid baths in King's Alley - Flying Post 1892.